Idaho has a rich history of gold prospecting. Records show that panning began sometime in the 1850s and initially it was unrewarding. The first major discovery of gold in the state came in 1862 with the Boise Basin gold strike. This prompted the establishment of numerous mining towns in the area such as Pioneerville, Placerville, and even Idaho City. Prospecting in Idaho has dropped significantly since the 19th century. Despite this, there is a still a lot of gold to be found in The Gem State. Both placer and lode gold have been reported throughout Idaho. Unsurprisingly, placer gold is the more common of the two and is often extracted from the state's rivers. Placer gold occurs when fragments of larger nuggets are dislodged and washed away. Because of its small size and its tendency to mix with debris, placer gold is markedly less valuable than lode gold. The value of placer gold falls somewhere between 70 and 90 percent of the current gold value. Lode gold is the name given to larger pieces of gold, such as nuggets. It's usually mined directly from quartz rocks. However on occasion lode gold enters rivers. So it's not unheard of for lucky prospectors to capture lode gold with their pans. Even though lode gold is reported less frequently than placer gold, it's more common in Idaho than in many other states. Two-thirds of Idaho's rivers are owned and controlled by the Bureau of Land Management. For the most part, anything under the BLM's control is safe for panning. However you should first check the official BLM website for the list of active mining claims. That way you will avoid unknowingly panning on one of the 2,321 active claims in Idaho. If your prospecting is limited to just panning, Idaho doesn't require you to have a license. But if you intend to use a suction dredge or another type of motorized equipment then you'll need to apply for a recreational mining permit. A recreational mining permit can be obtained from the Department of Water Resources. Using a suction dredge without approval is a violation of Idaho's Stream Channel Protection Act. This carries a minimum fine of $150 per day. Idaho's rivers are among the richest in all of America, but some of them contain more gold than others. In the section below, we'll be looking at some of the most reliable gold-bearing rivers in the state. Placer gold is commonly reported in each river, with some even producing lode gold on occasion. The Clearwater River is noteworthy as it runs through the city of Pierce. Located in Clearwater County, Pierce was the site of Idaho's first gold discovery back in 1860. The discovery was made by Elias D. Pierce and Wilbur F. Bassett at Orofino Creek, a tributary of the Clearwater River. A precursor to the Boise Basin gold strike, it encouraged numerous prospectors to relocate to the area. In the 150 years that have passed since Pierce and Bassett made their discovery, Clearwater River's popularity has not waned. Prospectors continue to pan in its waters, with the South Fork frequently producing placer gold. The American River is a tributary of the Clearwater River. 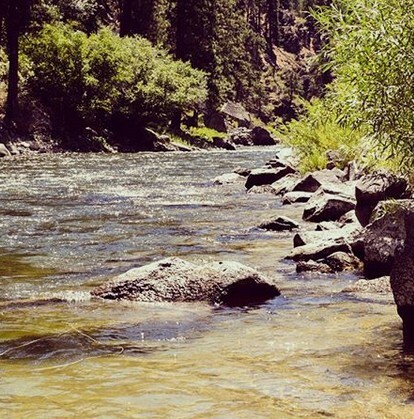 Located near Elk City, the American River is high in placer gold. This gold enters the river from Elk City's many hard rock mines. These mines also feed large amounts of gold into the Red River, which is another fruitful tributary of the Clearwater River. The Salmon River runs through the Idaho cities of Salmon and Challis. It has been the scene of more than a few large-scale dredging operations, but it's also a popular spot among recreational panners. Most of the gold extracted from the Salmon River is placer gold, but nuggets have been reported by a few fortunate prospectors. Gold can be found in virtually all stretches and tributaries of the Salmon River. However, certain stretches are closed to the public. This is because much of the river runs through the Idaho wilderness where the water becomes too rowdy for panning. Some parts of the Salmon River are so treacherous that they have earned it the nickname "The River of No Return". Experienced prospectors are advised to be careful while panning in the Salmon River. Novices are encouraged to take their prospecting to calmer rivers in the state. The Boise River was crucial to Idaho's expansion in the 19th century. Its gold content inspired the establishment of numerous mining towns along its shores. Among these towns was the unincorporated community of Atlanta. Prospectors in Atlanta extracted significant amounts of placer gold from the Boise River. Lode gold was also discovered in the area surrounding the camp. Major mining operations were conducted in Atlanta until the early 1950s. The Snake River is another favorite panning spot of Idaho prospectors. It's believed that a lot of gold still flow through the Idaho stretch of the Snake River. Prospectors have the best shot of finding some of that gold in the area around American Falls. 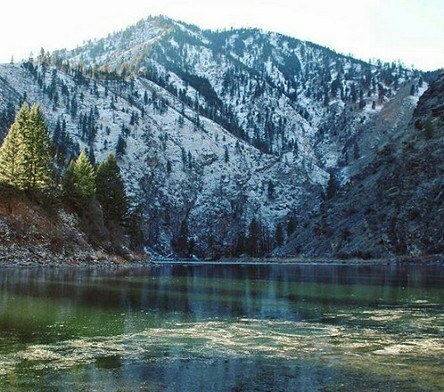 Although most Idaho portions of the Snake River are approved for prospecting, it's prohibited in the Hells Canyon National Recreation Area. The Payette River certainly isn't as productive as some of Idaho's other gold-bearing rivers. There are long stretches of this river that are completely devoid of gold. However if you know where to look, the Payette River can be rewarding. The South Fork of the Payette River gets pretty rowdy and hasn't been panned much as a result. This means that large amounts of placer gold likely lie undiscovered beneath its waters. We advise prospecting in the South Fork of the Payette River only if you have experience navigating rough waters. Prospectors less confident in their footing should take their pans to Garden Valley. The Garden Valley stretch of the Payette River is one of its most fruitful portions. There have been some nice gold discoveries there. Idaho is not a popular destination for tourists. This has both negative and positive effects on panning in the region. The downside is you'll likely struggle to find things to do when you're not prospecting. Dedicated prospectors will find the lack of tourists to be beneficial to them. 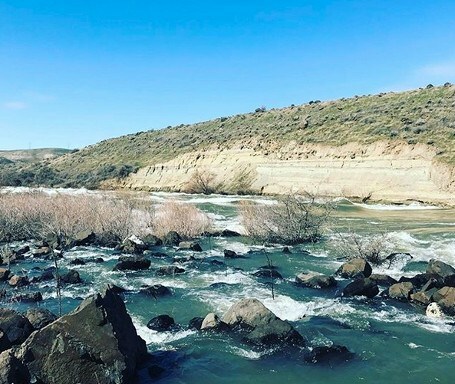 Because Idaho attracts fewer tourists than many other states, you won't have a hard time finding a comfortable prospecting spot in one of the state's richest rivers. In addition, there are also good prospecting opportunities in the neighboring states of Oregon and Montana.